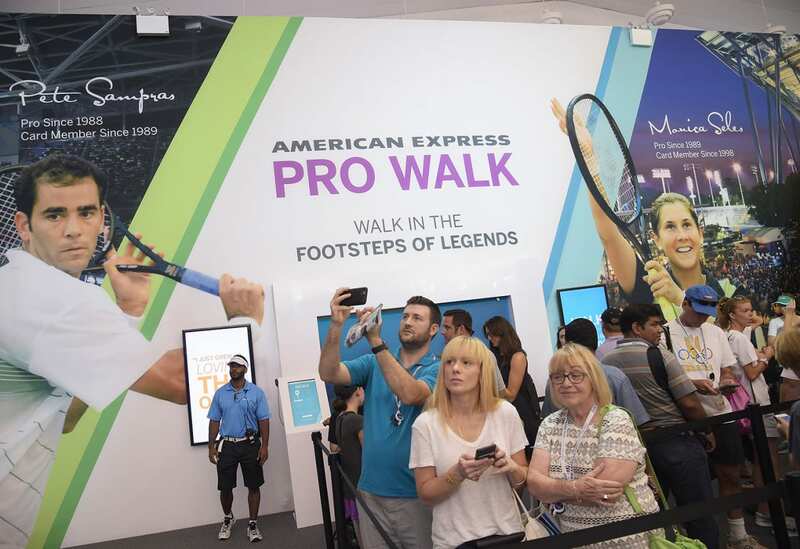 Thanks to American Express’s immersive Pro Walk, fans at this year’s US Open got to do something they would never get to do any other way—walk like a pro onto center court at Arthur Ashe Stadium and experience all the emotion and gravitas that entails along the way. 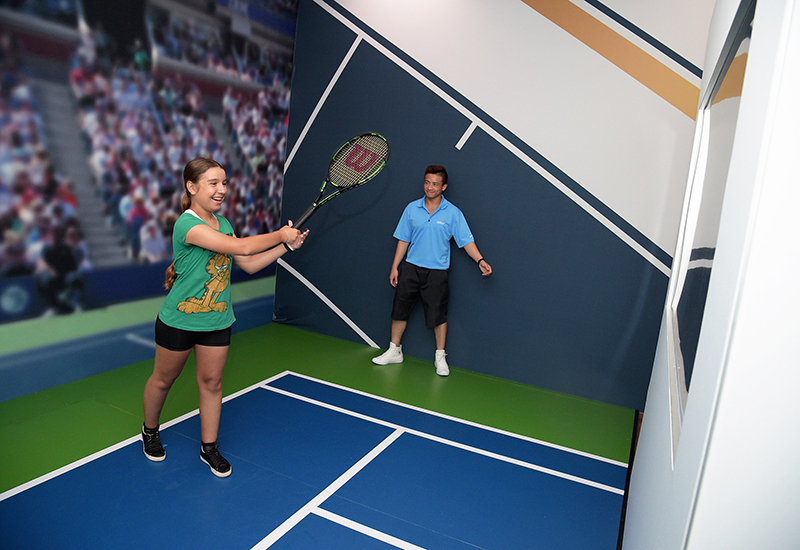 The activation was the centerpiece of the 20,000-square-foot US Open American Express Fan Experience, which in the past has included professional swing analysis, RFID-enabled wristbands, shareable videos and virtual reality. Pro Walk leveraged a projection-mapped geodesic dome in the form of a giant tennis ball, holograms, virtual reality, digital landscaping and a high-tech racquet to insert the fan into a storyline that began with Player Check-In and culminated with the roar of the stadium crowds. The experience tied in with the overall Open Like a Pro theme of the brand’s sponsorship activation this year. “Our inspiration this year was the notion that our cardmembers are almost professional fans. They come to the Open every year, get their radios, know where they want to go. 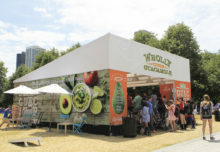 But this year there was a lot changing, from the roof to the grounds, and we wanted to help them take on the Open like never before,” says Deborah Curtis, vp-global sponsorships and experiential marketing at American Express. To that end, there was the American Express Card Member Club, with an array of complimentary services, a full-sized tennis court with live programming and athlete meet-and-greets, the American Express radios with play-by-play commentary and match updates and service-oriented brand ambassadors to answer questions. But Pro Walk elevated that strategy to a whole new level, forging an emotional connection with cardmembers and fans as they experienced behind-the-scene moments usually reserved for the pros. It was no doubt the first thing they saw when they entered the Fan Experience—the giant tennis ball that housed the projection-mapped dome, flanked by oversized images of Pete Sampras and Monica Seles and the call to “Walk in the Footsteps of Legends” above the doorway. Fans entered through the door to Player Check-In, registered for the experience, took a swing with a high-tech, connected tennis racquet and stated their name. (They understood why they had to do that later on in the experience.) Then the sound went up, the lights went down and they were welcomed to the Open, as an announcer reminded them of the tennis greats who have preceded them and set the stage for the moments that follow. Before they entered the 20-foot long by 18-foot wide Locker Room, fans proceeded down a mahogany hallway etched with the names of former champs, then into the locker room itself where holograms of Sampras and Seles greeted them and offered tips for the tennis experience to follow. A USTA official ushered fans along an LED-lined tunnel filled with surround-sound, audio cues and graphics, including throwback announcer clips of past championship matches and even the paparazzi calling out their names. An official announced that it was time to go, a door opened, and boom, they stepped inside the dome. Inside the dome, which, thanks to projection mapping was an exact replica of center court, the fans were announced and the big moment occurred. They saw themselves walking onto the court on the stadium Jumbotrons, a ball boy handed them a racquet, they took their position at the service line as they viewed an opponent off in the distance, swung and as their opponent missed the return, they won the rally to the roar of the crowds. Pro Walk took fans and cardmembers about four minutes to experience on-site. Fans could experience it individually or in groups of as many as four and at the end received a video of the experience to share with friends. Agency: Momentum Worldwide, New York City. Fans entered the Pro Walk through the door to Player Check-In, registered for the experience and took a swing with a high-tech, connected tennis racquet.